The link that brought you to this page and the page title are a bit of a misnomer, because this short report is not long enough to cover so many chapters of the Bible. What the link and the title do, however, is track where we are in our plan to read through the entire Bible in 1 year. May each report pique your interest and help you to draw near to God. The Bible, James 4:8, tells us if we do so God will draw near to us. 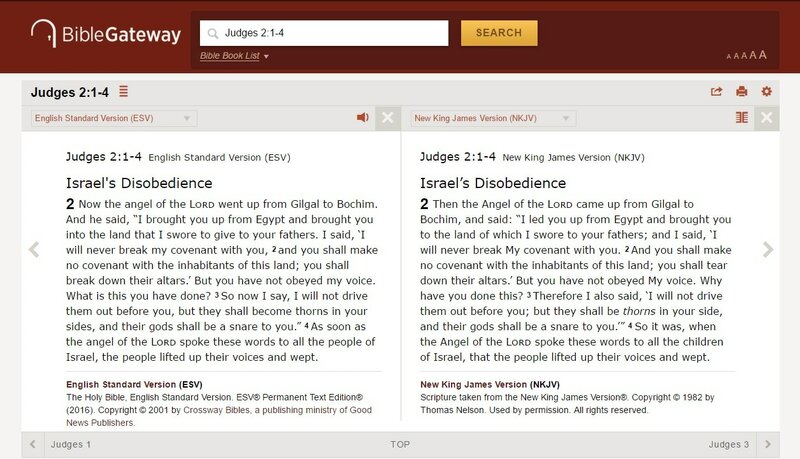 Works cited are at the end of the report and some screenshots, including a side by side screenshot of the ESV and the NKJV showing the dissimilar use of Angel of the Lord follows that. Internal links provide additional information. BIBLE READING—WEEK 12—JUDGES 3-21: In Last week’s Short Report I looked at a key person in the book of Joshua—Achan—an idolater and answered a simple question, “Is God cruel?” The answer, of course, was an emphatic, “No!” As I pointed out, God’s sovereign response to Achan’s sin can be applied to all sin no matter how minor or how pronounced the transgression is. God’s correction fits well into this past week’s reading on the book of Judges where “the people of Israel did what was evil in the sight of the Lord and served the Baals” (Jdgs 2:11). We are also told, “Everyone did what was right in his own eyes” (17:6). And we see their sense of right was often wrong—not only in their idolatry, but also in Jephthah's disastrous vow (11:30), for instance. Amid all this human freewill run amok, however, we see the Shepard always guiding and protecting the flock by raising up leaders that destroyed their idols (6:25-26) prevailed over their oppressors (8:11-12), and put Israel’s focus back on God (8:22-23). We even see several epiphanies of Christ, the Angel of the LORD. This Short Report will center on the multiple appearances of our Lord in this Old Testament book. The term “angel of the LORD” appears no less than 15 times in the book of Judges. From my quick review of the term that is more than it appears in any other book of the Bible. Many modern versions of the Bible, including the ESV and NIV (1984 & 2011) still use the lower case “a” in angel in each instance of the term and this adds to the confusion surrounding the Divine Messenger. In addition to several commentaries, including three Lutheran sources, I compare these verses alongside three other modern versions of the Bible, the AMP, HCSB, and NKJV. This is not to say one is better than another. With the exception of the NIV-2011, I use them all and consider them all to be good conservative versions of Holy Scripture. Rather, I do this to better understand what is going on when the term is used. Finally, although I use commonly used abbreviations that are well understood by most, they are explained below. My Bible verse quotes are from the ESV. In Judges/Ruth – People’s Bible Commentary Lawrenz also feels it is plain to see that God is speaking when he says, “This ‘angel’ led Israel through the wilderness in a pillar of cloud by day and in a flame by night” (35). The Keil and Delitzsch Commentary on the Old Testament agrees and they tell their readers that this is “the angel of the Lord who is of one essence with God” (Olive Tree). The Jamieson, Fausset, and Brown Commentary came to the same conclusion: “We are inclined to think, from the authoritative tone of his language, that he was the Angel of the Covenant (Ex 23:20; Jos 5:14)” (Olive Tree). Notice that Exodus 23:20 points forward to Joshua 5:14, which is another strong reference to the Angel being the pre-incarnate Christ, since He tells Joshua to take off his sandals because he is on holy ground. Would a created being sent from heaven dare speak as God? Of course not. Deborah is very aware of this fact as she tells Barak, “Up! For this is the day in which the Lord has given Sisera into your hand. Does not the Lord go out before you?” (Judges 4:14) There is no reason to doubt that Deborah is speaking of the Man who was worshiped by Joshua as “the commander of the army of the Lord” (Joshua 5:14). Many commentaries overlooked the term “angel of the LORD” in this verse. They do, however, consider the disposition of Meroz, which is cursed by the “angel of the LORD” in the 23rd verse of Deborah’s song. The Judges/Ruth – People’s Bible Commentary, for instance, points out Meroz “was a city that knew it was defying the Lord and did it anyway” (p. 74). The curse upon the inhabitants of this place is described as a word or command of the angel of the Lord, inasmuch as it was the angel of the Lord who fought for Israel at Megiddo, as the revealer of the invisible God, and smote the Canaanites. Deborah heard from him the words of the curse upon the inhabitants of Meroz, because they did not come to help Jehovah when He was fighting with and for the Israelites. The third place the term “angel of the LORD” happens is in chapter 6 in the 11th, 12th, 21st and 22nd verses. But thereafter the discourse continues in chapter 6 and runs through chapter 7. In context it appears that the Angel of the LORD introduces Himself to Gideon in chapter 6 as a Man who speaks with authority saying among other things, “Go in this might of yours and save Israel from the hand of Midian; do not I send you?” (v. 14) In response, Gideon asked his Visitor for a sign; he also asked the Man to wait while he prepared a meal. Once the meal is ready, the “angel of God” (v. 20) told Gideon to place the food on a rock and pour the broth over everything. Then the Man touches the tip of His staff to the rock and the rock released a fire that consumed the food as if it was a burnt offering to the Lord. At the same time the Man “vanished” (v. 21). Within the Levitical system of sacrifices established by Moses the burnt offering is one of total devotion to God. No doubt God is totally committed to using Gideon although the light isn’t quite on yet for Gideon, and there will be some foot-dragging before this is finished. Now that the Man is gone we are told Gideon then understood what had happened—and the dialogue continues! This time Gideon is hearing a voice in his head telling him not to fear and provides him with the peace that surpasses all understanding, which is the peace of God (v. 23; cf. Phil 4:7). This voice must be the same voice from the Visitor; a different voice would be too unsettling. This seems to be the same pattern God used with Moses (Ex 3) and Joshua (Josh 5) where, after a personal appearance, God directed or even interacted with them through a voice without physical form. Prior to Joshua 5 the Lord spoke to Joshua, Moses’s newly appointed second in command, through Eleazar the priest (Num 27:21). For Gideon, the voice again returns in the dark of night and directs him to tear down his father’s altar to Baal and the Asherah pole beside it and build an altar to God and to use one of his father’s bulls as a burnt offering to God (Jdgs 6:25-27). Later, still in chapter 6, Gideon has the famous fleece dialogue with God (vv. 36-40). Moving into chapter 7 the conversation continues while God limits Gideon’s army to 300 soldiers and the Midianites are defeated. The narrative finishes in chapter 8. The Bible makes it clear that “there is one mediator between God and men, the man Christ Jesus” (1Tim 2:5). Since the Angel that first appeared to Gideon and interactions with the Lord that followed were spoken to Gideon in one accord it is easy to conclude the Angel is the pre-incarnate Christ, not just a heavenly messenger. The Judges/Ruth – People’s Bible Commentary concurs, telling their readers, “The Lord Himself appeared in an out-of-the-way place to a most unlikely man.… The man was Gideon…. Gideon was the only judge to be called in person by God” (Lawrenz, 81). The call of Gideon took place in two revelations from God. First of all the Lord appeared to him in the visible form of an angel, in which He had already made himself known to the patriarchs, and summoned him in the strength of God to deliver Israel out of the hand of the Midianites (vv. 11-24). He then commanded him, in a dream of the night, to throw down his father's altar of Baal, and to offer a burnt-offering to Jehovah his God upon an altar erected for the purpose (vv. 25-32). In the first revelation the Lord acknowledged Gideon; in the second He summoned Gideon to acknowledge Him as his God. He appeared in the character and equipments of a traveller (Jud 6:21), who sat down in the shade to enjoy a little refreshment and repose. Entering into conversation on the engrossing topic of the times, the grievous oppression of the Midianites, he began urging Gideon to exert his well-known prowess on behalf of his country. Gideon, in replying, addresses him at first in a style equivalent (in Hebrew) to "sir," but afterwards gives to him the name usually applied to God. By saying “usually applied to God” some may think JFB are leaving themselves a little wiggle room but that is not the case. The full reading of the commentary makes it clear this is the Lord. They are, however, allowing for other places in Scripture where this is not the situation. The fourth and last event where the term “angel of the LORD” happens is in the 13th chapter in verses 3, 13, 15-18, and 20-21. In this 13th chapter of Judges the birth of Samson is announced to his parents and the conditions of his life as a Nazirite are set forth. Also, within this chapter three things happen that are comparable to Gideon’s experience: first, the Messenger does not (directly speaking) reveal who He is; second, when food is offered to the Messenger it is used as a burnt offering and He then vanishes in the flame; and third, after the fact, Samson’s father, Manoah, thought he and his wife would have to die for they had “seen God” (13:22). Certainly Manoah and his wife did not die, and their son, as was prophesied, saved “Israel from the hand of the Philistines” (v. 5). Manoah’s feelings aside, the Messenger’s name and how He vanished provide good insight, especially how the Messenger disappeared. Manoah does ask for the Messenger’s name in verse 18 and is told, “Why do you ask my name, seeing it is wonderful?” This brings to mind the name Wonderful Counselor from Isaiah 9:6. The best evidence that this is the pre-incarnate Christ, however, is how He once again vanishes while the flames are on the burnt offering, similar to His encounter with Gideon. Moreover, because the burnt offering is one of total devotion to the Lord, and because Jesus is the Lamb of God and the true sacrifice to God on our behalf, I cannot imagine any ordinary angel doing such a thing, since anything devoted to God belongs to Him alone. About His name, the Judges/Ruth – People’s Bible Commentary says, “The word used here is the same one in Isaiah’s messianic description of the Savior to come” (Lawrenz, 149-150). Lawrenz also ties the word wonderful from verse 18 and the phrase wonderful works from verse 19 together saying, “Both denote wonder beyond human capability (p. 150). To this the Zondervan NIV Bible Commentary adds, “The word translated wonderful has overtones of deity” (p. 1059). The Keil and Delitzsch Commentary on the Old Testament says, “The word [wonderful] is to be understood in an absolute sense—‘absolutely and supremely wonderful’ (Seb. Schmidt)—as a predicate belonging to God alone (compare the term ‘Wonderful’ in Isa. 9:6)” (Olive Tree). As to the burnt offering Lawrenz gives this account: “Suddenly the awe-inspiring presence of the true God revealed itself in a flash of fire that swallowed up the visitor and sent him heavenward” (p. 150). Keil and Delitzsch give a similar statement telling their readers, “The angel of the Lord, who is of one nature with God ... ascended in this flame” (Olive Tree). Speaking to both the name and the flame the Jamieson, Fausset, and Brown Commentary tell their readers that “Manoah's request elicited the most unequivocal proofs of the divinity of his supernatural visitor--in his name "secret" (in the Margin, "wonderful"), and in the miraculous flame that betokened the acceptance of the sacrifice” (Olive Tree). Being an older commentary the JFB uses the words from the KJV. That they report the word wonderful in the margin notes helps to explain the use of the word secret within the original text, since פִּלְאִי (p̱il’îy); or פָּלִיא (paliy’); come from a common root word and can be translated as secret or wonderful, and is translated as wonderful in Psalm 139:6 (Olive Tree). Judg 2:1, as part of the prologue to the cycle of the judges, describes Yahweh’s Messenger. He brings a stern warning to Israelite leaders assembled at Gilgal. In Judg 6:12 he makes a dramatic appearance to Gideon and throughout Judg 13 this same Messenger appears to the husband and wife who became Samson’s parents. This Messenger is unlike other angelic beings in the OT. He displays divine attributes, actions, and names. He is even worshiped. The NT calls him Jesus (e.g., Gal 4:14; Rev 20:1-3). In conclusion, my examination of the book of Joshua leads me to believe that every occurrence of the term “angle of the LORD” in this Old Testament book is speaking of the pre-incarnate Christ. AMP Amplified Bible (current edition). AMPC Amplified Bible, Classic Edition (The original edition once called the AMP. Though not used, info supplied for completeness). NIV 1984 New International Version first released in 1973 and last updated in 1984. NKJV New King James Version. NIV 2011 A gender neutral and vastly different version of the NIV. Quote from Si Cochran: "In the end, I cannot recommend this translation, and I actually encourage others to avoid it as a reading/study Bible. While there are many godly Christians serving on the CBT [Committee on Bible Translation] (as well as some complementarians), the committee as a whole has embraced a translation philosophy that often reflects our culture more than it reflects the biblical text." Jamieson, Robert, A. R. Fausset, and David Brown, ​Jamieson, Fausset, and Brown Commentary. Olive Tree (for the Olive Tree App). Lawrenz, John C., Judges/Ruth - People's Bible Commentary. Concordia Publishing House, 1999. Zondervan NIV Bible Commentary: An Abridgment of the Gold Medallion-Winning Expositor's Bible Commentary, Volume 1: Old Testament. Barker, Kenneth, L., and John Kohlenberger III (Consulting Editors). Zondervan Publishing House, 1994.